In the data center, the network rack and cabinet are used to house the router, switch, copper or fiber patch panel and other networking devices and accessories. They are meant to protect the hardware as well as make it easily accessible for modification, alteration as the business evolves and changes. This post will list tips that need to be kept in mind when picking your network rack and cabinet for your data center. The network rack and cabinet play a significant role in the data center. They organize networking devices, such as switches, into standardized assemblies. In this way, space and other resources can be effectively utilized. What’s more, to meet varied needs, the network rack and cabinet have multiple functions. They can improve rack cable management, device management, physical security, mobility, ease of installation and protection from harsh environmental conditions, etc. Therefore, the use of network racks and cabinets is very necessary. Picking the right network rack and cabinet, and configuring them as your needs can ensure that your equipment works reliably and efficiently. Besides, this frees your organization from costly downtime and other unnecessary expenses. Below are some considerations for picking the right network rack and cabinet. Before you choose a rack or cabinet, you need to clear what equipment you are going to house, such as switches, routers, and so on. Then you need to consider the weight and size of your equipment. If you are going to house large and heavy equipment, the amount of weight capacity of a rack or cabinet must be important. It is vital for your data center that your rack or cabinet has sufficient internal space to house your current devices and to accommodate your planned future expansion. Therefore, the size and the hosing space of a rack and cabinet such as height, width, and rated load must be taken into consideration. In the data center, every piece of networking equipment has cooling requirements. Different racks or cabinets have different structures, so the airflow is different. Therefore, when picking your rack or cabinet, the cooling system is also a factor that needs to be considered. There is no doubt that equipment in racks or cabinets also need plenty of power. There are multiple options to power the equipment in racks or cabinets. The power strips can be mounted horizontally and vertically. Therefore the power providing of the equipment in your rack or cabinet is another consideration you need to keep in mind. Here are some network rack and cabinet recommendations for reference. Suitable for enterprise data centers and computer rooms, the 9U wall mount cabinet is designed to house the 19-inch standard or non-standard network equipment, as well as network accessories. It is perfect for the areas with limited floor space, and it can provide the equipment with a secure and organized environment. It has convenient cable access openings, top cooling fan, vented glass front door, and lockable/removable side panels. 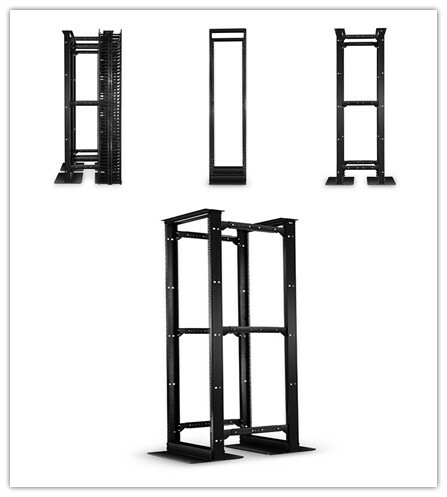 The open-frame rack provides easy access and plenty of open space for rack cable management. All these make it perfect for network wiring closets and distribution frame applications with high-density cabling. The open-frame rack is typically used for server room and data center rack applications that don’t require physical security and added airflow control. It has been stressed many times that network rack and cabinet play an indispensable role in organizing equipment in the data center. The process of choosing the right rack or cabinet is often important. 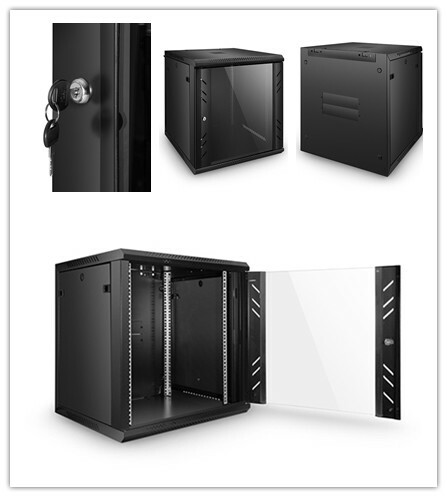 FS.COM can provide not only network rack and cabinet, but also server rack and cabinet as well as other rack accessories. If you have any need about this, you can contact us just by visiting www.fs.com. This entry was posted in Cable Management and tagged network rack and cabinet, rack and cabinet, rack cable management, server rack on September 19, 2018 by Admin.